Adventure awaits you every single day in Denver! From historical landmarks to pedestrian-friendly malls and gravity-defying rides, downtown has something for everyone! At the heart of the city is Denver’s well-known mile-long 16th Street Mall. This pedestrian-friendly strip is comprised of red, white, and gray granite that looks similar to a Diamondback rattlesnake when viewed from above. Free shuttle buses stop on every corner, allowing pedestrians to hop on and off and stroll as they wish. My favorite bookstore, the Tattered Cover Book Store, is located at the end of the 16th Street Mall, near Union Station. This is a perfect spot to order a chai, curl up in a comfy chair, and relax with a good read. 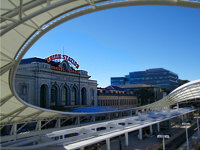 Denver Union Station is a must-see! This Beaux-Arts train station houses ten chef-owned restaurants and bars, boutique shops, and The Crawford, a 112-room hotel.. Denver Union Station, which was originally constructed in 1881, recently went through a major renovation and is now a hot spot for happy hour drinks and chatting over coffee. Biweekly tours of the station include a drink at the popular Terminal Bar. One block southeast of the Union Station, is The Oxford Hotel, Denver’s oldest active hostelry, which opened its doors in 1891. This hotel is full of history, has a great Western art collection, and is home to the award-winning cocktail lounge The Cruise Room. Modeled after a lounge on the Queen Mary, a red glow illuminates wall panels that depict light-hearted toasts from around the world. Lower downtown Denver (LoDo) has been completely restored and renovated over the years, making it one of the hippest areas in the city and Denver’s premiere historic district! This area is home to 90 brewpubs, 20 art galleries, and dozens of professional service and retail businesses. If you’re a jazz lover, El Chapultepec is worth a visit – it has been listed as one of the 50 Best Bars in America by Esquire Magazine. Larimer Square epitomizes urban style and sophistication. What was once Denver’s first city block is now the area's trendy and chic fashion district, full of specialty boutiques in Victorian buildings. There is always something exciting happening in this vibrant part of downtown! Don't miss the golden-domed Colorado State Capitol building when viewing Denver’s skyline. It sits exactly one mile above sea level! If you have time for a visit to the capitol building, climb up to the rotunda for a magnificent view of the snowcapped peaks that surround the Denver area. Free tours of the building are offered Monday through Friday. Denver proudly claims the only downtown theme park in America,- Elitch Gardens Theme and Water Park which has been located in the heart of the city for over 125 years! Enjoy 53 thrill rides, including roller coasters, water slides, and a wave pool, as well as free concerts. 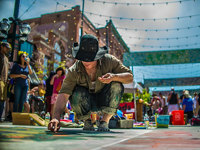 Creative souls will not be disappointed with Denver’s thriving art scene. Located on the South end of Denver is the Golden Triangle Museum District. You can find eight of the city’s must-see museums. Featuring jutting peaks, the building that houses the Denver Art Museum cuts a striking silhouette. Two architecturally stunning buildings make up the museum. Inside you’ll find the world’s greatest collection of Native American art, along with European pieces and Old West classics. Denver’s public transportation system is inexpensive and easy to navigate. You can get around most places in the Mile High City by light rail or bus. Stations are conveniently located around the city and if you have a car, you can easily park and ride on the public transport system. For information and schedules, please visit the Denver's Convention & Visitors Bureau's website. Interested in renting a bike? The country’s fittest city has hundreds of miles of dedicated bike paths through beautiful terrain. A 15-mile paved path stretches across the city, making most locations accessible by bike. Denver B-Cycle, a bike sharing system, is a very inexpensive way to make short bike trips around Denver. The weather in May should be ideal for bike riding. Michele Friedmann is the Local Arrangements Team (LAT) communications chair for the NAFSA 2016 Annual Conference & Expo. Michele was born and raised in Reading, Pennsylvania. She attended Gettysburg College where her love for study abroad began. Michele spent a semester in Australia, circumnavigated the globe on Semester at Sea, and student taught in London. Michele earned a master’s degree from the School for International Training in the area of international education. She interned for Barcelona SAE as a program and student adviser. She has worked for the Institute of International Education and the Fulbright Foreign Student Program. Michele is currently the student and program manager for Global Players, a study abroad program geared toward student athletes.